Adventures in the Endless Pursuit of Entertainment: Tonight: Kate Baldwin at Birdland! 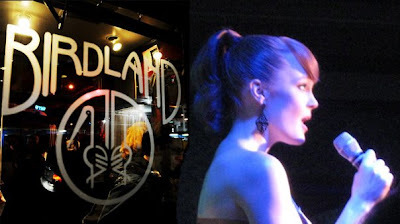 Tonight: Kate Baldwin at Birdland! Kate Baldwin will perform songs from her bestselling PS Classics album Let's See What Happens in concert tonight at Birdland. Birdland is on West 44th. To make reservations call 212-581-3080. Visit www.birdlandjazz.com for more information.The concert begins at 7:00 pm. Coming up for Kate is an ensemble concert of Life Begins at 8:40 in Washington, D.C. at the Library of Congress on Monday, March 22, 2010. The cast includes Broadway and recording veterans Kate Baldwin, Phillip Chaffin, Christopher Fitzgerald, Montego Glover, Rebecca Luker, Brad Oscar, Faith Prince, Graham Rowat and Jessica Stone. An album featuring this cast will be recorded by the PS Classics and produced by Tommy Krasker. The Library’s Coolidge Auditorium is located on the ground floor of its magnificent Thomas Jefferson Building at 10 First St. S.E. in Washington, D.C. A limited number of tickets will be made available to the public directly from the Music Division. For more information, please telephone or email Elizabeth Auman at (301) 974-5820 or eaum@loc.gov or Michele Glymph at (202) 707-8656 or mgly@loc.gov. Don't forget to click here to become a Fan of Kate on Facebook!